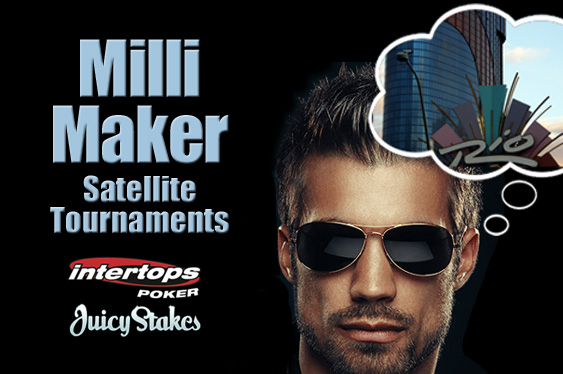 Juicy Stakes and Intertops Poker will be launching their three-stage Vegas Milli Maker tournament series from tomorrow offering players the chance to win a prize package to compete in the upcoming Millionaire Maker event at the 48th annual edition of the World Series Of Poker (WSOP) in Las Vegas. Set to take place from June 10 to June 14 at the Rio All-Suite Las Vegas Hotel And Casino, the $1,500 buy-in no-limit hold‘em Millionaire Maker event will see the winner walk away with a guaranteed $1 million in cash although players at Juicy Stakes and Intertops Poker are to be given the chance to compete for as little as $1.10. From April 14 to April 22 the Horizon Poker Network sites will each be running daily $3.30 buy-in step-one Vegas Milli Maker qualifiers at 4:10am, 4:20pm, 6:20pm, 8:20pm and 10:20pm New York time with the winners receiving complimentary seats into subsequent $9.90 buy-in games due to be held at 7:50pm between April 15 and April 22. The champions of these step-two competitions will then be gifted with spots into a $110 buy-in final due to take place on April 23 at 7:50pm where the victor will receive a prize package for the WSOP’s Millionaire Maker worth $3,500. The sites explained that the Vegas Milli Maker prize package is set to include the $1,500 Millionaire Maker buy-in along with six nights’ accommodation for two and $500 to help with travel expenses. Last year’s WSOP Millionaire Maker saw 32-year-old San Diego resident Jason DeWitt top over 7,000 runners to take home the title and $1,065,403 in cash while the event moreover awarded a cool $1 million to runner-up Garrett Greer. Sites are running a three-stage online poker tournament series awarding seats into the upcoming WSOP Millionaire Maker event in Las Vegas, Nevada.